I'm seconds away from ordering this cozy sweater from AE! I think it would look great with skinny jeans/jeggings and the boots I purchased below. You can view a few more for under $100 here, here, and here. Target's Mossimo Supply Katherine Boot - These are a dead ringer for the Frye Harness boots that retail for a whole lot more $$. I had been debating these for awhile but wasn't 100% sure they would work with my style until I saw a girl wearing them with some skinny jeans, a basic long sleeve black tee, and a scarf. Adorable. CB2's Wall Sconces - I've been looking for something to go over the large wall on our couch for awhile now and I think a set of these will look great. I'm looking forward to their arrival! - I'm hoping these will work on the nightstands in my bedroom. 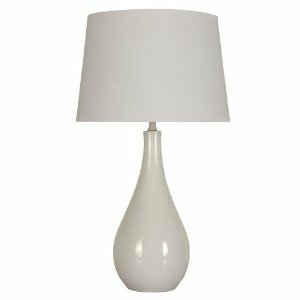 I've been looking for lamps for what seems like forever and these were just what I was searching for! Loeffler Randall's draped pocket coat - gorgeous. Hive and Honey Carmel boot - These aren't terribly pricey but heeled boots like this aren't always practical for my lifestyle. I adore them though! Love the AE sweater and Hive and Honey boots. Great finds!! Great picks! I would love to see the AE sweater in a OOTD! The AE sweater seems right up your style alley. Very cute. Loooove the Loeffler Randall coat. Wow. OMG that pocket jacket is AH-MAZING!! I totally caved and bought those boots when they were Target's daily deal a while ago. Worth every penny! I MUST have that AE cardigan! MUST!!!! This is a bit belated but do you think the target boots are worth it? Or would it be better to spend a bit more for frye? Jenny - Aren't they adorable? Andi - I have been holding off on ordering, I think I may see if they have it in the store so I can try it on and save on shipping. I will try and post an OOTD once I get it! Gigi - Isn't that coat gorgeous?! Amber - I know. I think I need it. Lol. Alicia - Don't you love them? Mine arrived last week and I have already worn them a ton. Bex - I think they are worth it. They are genuine leather and they look so much like the Frye's - I wore them last week and had a few people stop me and ask me if they were the Frye boots and where I bought them. They were all surprised when I said Target! Unless you feel like splurging, I think the Target version is definitely worth buying.